Beautiful Introduction to the always Beautiful and Profound Poetry of Mary Oliver! Had not see Poppies before. Thank you, again, for sharing your appreciation of this great poet. That lovely painting by Georgia O’Keeffe, another great American artist, seems appropriate! Thanks Ken. 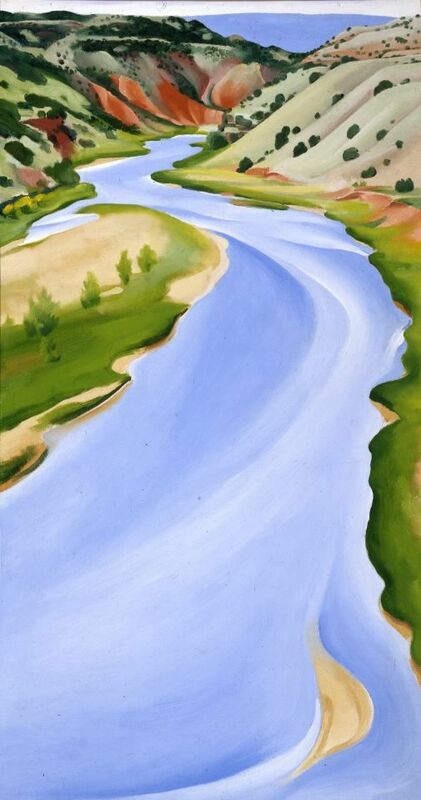 I searched a long while for the perfect image to go with this, and when I saw O’Keeffe’s river, i knew this was it. I had never seen it before. It is perfect! Thanks for sharing Mary’s exquisite poetry. May her spirit live on in the hearts of poets everywhere. I think her spirit will live on and I hope she will find new readers in coming generations too. Thanks, Brad. What a lovely thing! Thank you so much Pat! Thank you for sharing that Laura! I love it. It suits her so well. What a beautiful tribute to Mary and her poetry. Your words shine with reverence for Mary, and even evoke her style of writing. Thanks for stirring me to write my own post about Mary, even though I swore I wouldn’t! I will be looking forward to reading your tribute. Can’t get enough of her! Mary Oliver was a wonderful poet. The world won’t be the same without her. This was a lovely tribute! Thank you very much for this collection. I believe I could read them daily and be washed and washed by her beautiful images. The Georgia O’Keeffe painting and your words fit perfectly. I’m glad you enjoyed them, JoAnna. Thank you so much. How beautiful and true. Very inspiring. Sending you warm hugs from Istanbul.